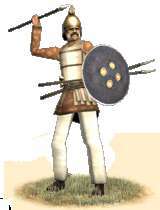 Peltastai Indohellenikoi can be used as a good medium infantry, to screen the flanks and protect against elephants and cavalry while the Thureophoroi deliver the fatal melee blow. After the kingdom of Baktria attacked and seized its Indian possessions, it found the Greeks who had been living there had adapted somewhat to native ways. Gone was the close phalanx formation and the long spear, replaced by a somewhat looser but more skilled melee formation. They adopted a Phrygian style helmet, light cotton Thracian trousers, and javelins, in addition to a smaller and lighter shield. This allows them to be excellent elephant killers, as well as defeat the more lightly armored infantry of the east. They can be used as a good medium infantry, to screen the flanks and protect against elephants and cavalry while the Thureophoroi deliver the fatal melee blow. Historically, the Indo-Greeks adapted quite well to the environment of India and prospered. Many became Buddhists, though they still remained fierce warriors, true to their Hellenic forbearers. They are an excellent medium infantry, well able to compliment other troop types and provide a versatile unit against light cavalry and elephants.